Note: This is the bound book only and does not include access to the Enhanced Pearson eText. To order the Enhanced Pearson eText packaged with a bound book, use ISBN 0134471881. A practical approach to identifying, understanding, and helping students with language difficulties achieve success in school and beyond. 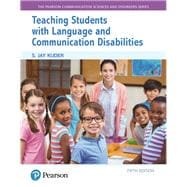 With an emphasis on the connection between language and literacy, Teaching Students with Language and Communication Disabilities explores language development and language disorders within the context of specific disabilities. The book is designed to help teachers and other professionals acquire knowledge about language, language development, language disorders, and evidence-based practices for enhancing language skills that will enable them to become more effective teachers and/or clinicians. Student vignettes, teacher perspectives, activities, and literacy sections foster the application of concepts to real classroom situations. The Fifth Edition includes reconceptualized chapters that use the Response to Intervention (RtI) model as as the framework for classroom-based language assessment and instructional methods. Expanded discussions of emerging teaching technologies and the latest research literature are included throughout the book. The Enhanced Pearson eText version of the text features embedded videos, check your understanding quizzes, and application exercises. S. Jay Kuder is a professor in the Department of Interdisciplinary and Inclusive Education at Rowan University in Glassboro, NJ., where he coordinates the graduate programs in special education and autism. Dr. Kuder’s research interests are in the development of effective practices for enhancing the language and literacy skills of children with disabilities. His recent research has focused on the use of technology to enhance communication and social skills in students with autism spectrum disorders. Dr. Kuder holds a masters degree in special education from Temple University and a doctoral degree in applied psycholinguistics from Boston University. He is a member of the American Speech-Language-Hearing Association, the Council for Exceptional Children, and a fellow of the American Association on Intellectual Disabilities, and has served on the New Jersey Special Education advisory board.